The Subbética Greenway runs for 58 km through the south of the province of Cordoba following the route of the old Olive Oil Train. Today this trail, between the river Guadajoz near the town of Luque and the village of Navas del Selpillar, allows cyclists and walkers to enjoy the beautiful landscapes of the Sierras Subbéticas Natural Park and the rich birdlife of the Laguna del Salobral Nature Reserve. The Greenway passes close to picturesque towns and villages, such as Luque, Zuheros, Doña Mencía, Cabra, and Lucena and is dotted with majestic castles and one or two mysterious caves. The prolongation of this route the province of Jaen will make an incredible 112 km long Greenway. 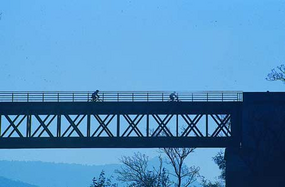 The Greenway starts on an impressive viaduct spanning the river Guadajoz, which at this point forms the natural border between Jaen y Cordoba. After crossing the river we climb steadily up a gentle incline with olive groves on either side. The trail leaves the river behind and clings to the terrain in a series of sweeping curves and deep cuttings. This climb lasts for just three kilometres before we arrive at the top of a hill called Collado de las Arcas. Here we can see the remains of an old through station (an apeadero) and an even older ore loading facility. From here we arrive at one of the most attractive spots on this route: the Laguna del Salobral. Here the line runs along the top of an embankment which, combined with the natural height of the land and some purpose-built viewing points, gives us an excellent view over the Laguna del Salobral (or Laguna del Conde as it is also known). For those interested in bird watching, spring is the best time of year to come, when the lake is full of water and alive with ducks. We leave water and ducks behind and continue on our way. Passing between ever-present olive trees we arrive at the N-432 road where a dangerous level crossing has been replaced by a bridge which takes us safely to the other side. A gentle climb around sweeping curves takes us to Luque station. An enterprising businessman has taken the old railway building over and has converted it into a restaurant with a décor based on old railway artefacts. From here we make our way to the next stop, Zuheros, but not before climbing up to the town of Luque by a dirt track from the station to have a look round. A picturesque route along the foot of the mountains takes us to the compact but attractive village of Zuheros. Just before we arrive, we pass by the municipal swimming pool, after which we reach the remains of the old Apeadero de Zuheros. The village itself is at a higher level than the old railway line, but the climb is rewarded by the chance to take a stroll around the streets of Zuheros, especially in spring when the flowers are in bloom. From the town square there is an excellent view down to our Greenway, the only flat ground in a mountainous terrain. Back at the Greenway, we leave the apeadero and just a few metres further on we arrive at the Zuheros bridge. This metal construction, which sweeps in a majestic curve across the Arroyo Bailón river, is listed as an architecturally interesting bridge. We continue between olive groves to another village clinging to a hillside, the village of Doña Mencía. Our Greenway skirts around the village before arriving at the station (Km 20) which, like Luque station, has also been converted into a restaurant. We leave Mencía and enter into a section of Greenway which is more or less level, but only thanks to some major earthworks. We travel on top of spectacular embankments and at the bottom of deep cuttings, the latter faced with elegant stonework. Throughout the entire route, every so often we come across railway workers ’cottages; from the one at Km 22 there offers a wonderful outlook superheat village of Doña Mencia. Furthermore, this box has been restored by the City of Dona Mencia, through the Sustainable Tourism Program of the Subbética Cordoba, to shelter in the future other tourist information. After crossing a bridge over the old Cabra road we reach the only tunnel on this route, the Plantío Tunnel. A bare 140m from here we begin to drop down to the town of Cabra. In this section the old railway line had to overcome difficult terrain, as is evidenced by an abundance of major earthworks and other railway structures. After skirting round the Cerro Alvarillo hill, our Greenway crosses the Arroyo del Fresno river on a spectacular, 132 m long railway viaduct, the Sima Viaduct. A kilometre later we cross the road by another, shorter viaduct called “Los Dientes de la Vieja” (The Old Woman’s Teeth), a mere 25m long. We cross the same road twice more, the first time at a level crossing and the second by a bridge, and a little later the town of Cabra comes into view at the end of a gently winding track. Cabra station and its main building have recently been restored to house the Olive Oil Train Interpretation Centre, which provides basic information about the old railway, the Greenway, and the rural district of La Subbética. Visiting is a must. We leave Cabra and return to a landscape of olive groves where we make our way through an especially tranquil countryside to the viaduct over the Barranco del Alamedal. (Km 39). On the far side we move into an area of vineyards as we approach the town of Lucena. Here we need to pay a visit to the Lucena Tourism and Leisure Centre, an old railway facility that has been refurbished for the purpose. The main building is home to an interpretation centre for local crafts and traditions, and a tourist information office (Km 44). We leave Lucena station and after crossing over several more bridges over various roads we take our leave of the town through an industrial area parallel to the Cordoba road. After a gently winding descent punctuated by a number of metal bridges over water courses or rural roads we reach the last station on our route, Moriles-Horcajo. The station, with its elegant and well preserved station building, is in the village of Las Navas de Selpillar, and is currently being refurbished as an interpretation centre for Montilla-Moriles wine. To all intents and purposes, this station is the end of the La Subbética Greenway at the moment. The Greenway as such extends for another four kilometres to the border between the municipalities of Lucena and Aguilar, but beyond that point the rail bed is undeveloped and it would necessarily be a there-and-back journey of little interest. However, we expect work on the prolongation of the Greenway to the town of Puente Genil ten kilometres away to be completed shortly. And thanks to the refurbishment of the Ministry of Environment and Rural and Marine Affairs in 2011 as a greenway recover the 7.8 km railway platform between Moriles-Lucena city limits, where the Greenway ends today, andReal Country Station to 2.2 km from the town of Puente Genil. In spite of the fact that attempts were made to build a railway through the capital of Jaen since 1881, it was not until 1893 when the first trains ran through this city on their way to Puente Genil. With this new line, the Compañía de los Ferrocarriles Andaluces created a new access route into Andalusia from Linares which connected at Puente Genil with existing routes from Cordoba to Malaga and Algeciras. The line was to compete with the main railway access to Andalusia from the Castilian tableland which ran through the Guadalquivir valley and was operated by the all-powerful MZA railway company. One of the most important cargos carried by the new railway was bulk olive oil transported in tank wagons. The transport of olive oil was so important that the railway came to be known popularly as the “Olive Oil Train”, a name which our Greenway today has inherited. But as well as olive oil, the railway also used to transport coal from the Belmez coalfields, and lead and other metals from the deposits around Linares, to the port of Malaga. But the railway was never really a financial success. Except for a brief period of prosperity at the end of the 19th century during the Cuban War, the business made losses year after year. Thus in 1936, this line, along with all the other lines making up the extensive “Andalusian” railway network, was taken over by the State when it was seen that the company’s financial position was unsustainable. Another conflict, the Spanish Civil War, briefly breathed new life into the railway for strategic reasons; the line provided an alternative to the frequently bomb damaged Espeluy-Sevilla line. But when the guns fell quiet, so did the locomotives, which became an increasingly rare sight on the line, and when they did run it was at the breathtaking average speed of 30 km/h!. The railway remained in this precarious situation until 1985 when the entire section between Jaen and Puente Genil was closed down, along with hundreds more kilometres of line all over Spain. Fifteen years on, machines of another kind ran along the ballast rail bed to convert it into the magnificent Greenway that it is today. La Vía Verde de la Subbética ofrece un magnífico recorrido de 56 km entre olivos, imponentes viaductos metálicos y pueblos que se La Vía Verde de la Subbética ofrece un magnífico recorrido de 56 km entre olivos, imponentes viaductos metálicos y pueblos que se asoman desde el Parque Natural de las Sierras Subbéticas. Todas las antiguas estaciones han sido rehabilitadas con nuevos usos para los viajeros, desde cálidos restaurantes a interesantes centros de interpretación que recuperan la historia del ferrocarril del Aceite.